We've put together a number of collections of kanji, as well as Japanese words and names for you to use. If you want to focus specifically on learning kanji and words, or just explore, these collections are for you. Note: we recommend you use our comprehensive study program (with kanji drawing practice, games, flashcards, grammar and more) to guide your studies - start with the Beginner Lessons or Intermediate Lessons, or the Textbook Companion if you're using an existing textbook. If you are just getting started, the hiragana, katakana, the 100 most frequent kanji and the 50 most common components are ideal ways to begin. 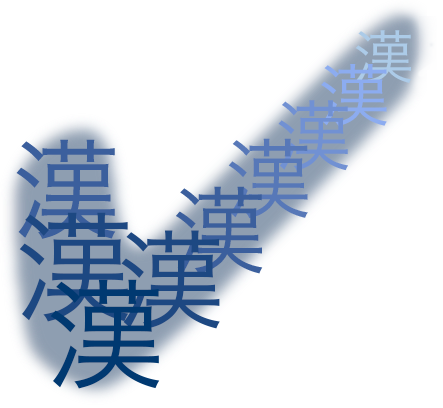 The Core kanji collections include kanji grouped into standard sets such as grade level (Kyōiku Kanji), type (Jōyō, Jinmeiyō), JLPT etc. The NEW Kanshudo collections of vocab organized by usefulness present an ordered list of the most useful 10,000 words in Japanese, broken into 100 word sets! Start with section 1 - the most 500 useful words in Japanese. The Wikipedia JLPT vocab collections cover about 8200 of the most useful words in Japanese, organized by JLPT level. Our vocab lists corresponding to the iKnow 6000 and Routledge 5000 are also great ways to prioritize your vocabulary studies. If you are already engaged in a study program, the kanji in the graded series Genki or Japanese for Busy People will be useful. We also include several thematic collections, and three collections of the most common Japanese names. The Jōyō Kanji are the 2136 kanji taught in Japanese schools, and considered the most important kanji for 'daily use'. With sound knowledge of the Joyo kanji, you will be able to read any newspaper and most novels, and easily manage in daily life. Use Quick Study, create flashcards, view your mastery level, or download data for each of these twenty-one collections. The Kyōiku Kanji are the 1006 kanji taught in Japanese schools from grades one to six. Use Quick Study, create flashcards, view your mastery level, or download data for each of these six collections. The Secondary School Kanji are the 1130 kanji taught in Japanese schools from grades seven to twelve. Use Quick Study, create flashcards, view your mastery level, or download data for each of these eleven collections. The Jinmeiyō Kanji are the 862 kanji allowed for use in names, in addition to the Jōyō Kanji (for a total of 2998). Kanshudo uniquely presents the Jinmeiyo ordered by their actual usage in Japanese names. Use Quick Study, create flashcards, view your mastery level, or download data for each of these nine collections. In 2010, 196 kanji were added to the Jōyō Kanji list - here they are in one place for easy study. Use Quick Study, create flashcards, view your mastery level, or download the data. In 2020, an additional 20 kanji will be added to the Kyōiku Kanji list. Use Quick Study, create flashcards, view your mastery level, or download the data. The full list of Jōyō Kanji organized into the 5 levels of the JLPT, and further prioritized by frequency. Build your Japanese vocabulary! This fantastic new set of 102 collections contains the 10,000 most useful words in Japanese, organized by priority for a new Japanese learner. The Kanshudo usefulness level ranking is based on the most comprehensive assessment of Japanese word usage in a variety of contexts ever undertaken. Prioritize your studies with the confidence you are learning the most useful words first! Use Quick Study, create flashcards, or download the data! Wikipedia JLPT Vocab Build your Japanese vocabulary! This fantastic new set of 84 collections contains 8183 of the most useful words in Japanese, organized by the JLPT level they first appear in (as classified in Wikipedia). Sets are organized into five groups for N5-N1 vocab, and within each group, words are prioritized by overall usefulness, so you can study the most useful words first. Use Quick Study, create flashcards, or download the data! iKnow! Core 6000 This set of 60 collections contains the 6000 words in the iKnow! Core 6000 list. Words are organized into 60 sets of 100 words, introduced in the same order as the iKnow! system. Use Quick Study, create flashcards, or download the data! Routledge 5000 This set of 50 collections contains the 5000 words in the Routledge 5000 frequency list. Words are organized into 50 sets of about 100 words, introduced in the same order as the Routledge list. Use Quick Study, create flashcards, or download the data! Genki The 21 Genki collections include all kanji introduced in both books of the Genki textbook series. Japanese for Busy People Edition 3 The new Edition 3 Japanese for Busy People collections include all kanji introduced in the updated third edition of the Japanese for Busy People textbook series. The 42 Japanese for Busy People collections include all kanji introduced in the Japanese for Busy People textbook series. This collection includes all kanji with detailed informative essays by Joy o' Kanji. Read the synopsis of each essay on Kanshudo, or click through to Joy o' Kanji for the full essay. Our three name collections provide easy access to the most common names in Japanese. If you are looking for details for a specific name, try Name search.